If you love the unique, different, and original and you want a vehicle that reflects those some things you value in your own life, then the Lancia Ypsilon model is a perfect choice for you! It is a compact car that has so much to offer- fuel efficiency of 5.17 L/100km or 57.6mpg, manual drive, and high safety ratings and features. This model comfortable seats up to 4 and thanks to a 5 door design, you can get to any part of the vehicle quickly and easily. 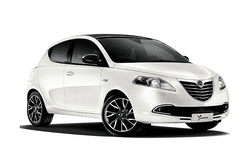 The Lancia Ypsilon can meet any needs that you may have when it comes to transportation and is popular among locals and visitors alike who are in need of a quality vehicle to meet their car rental needs. Check it out for yourself today!